Regardless of generation or age, these days, men are investing more time, energy and money in their appearance than ever before. At Pure Beauty we are here to help everyone look, and feel, great, and today we are looking at products that give men a boost! 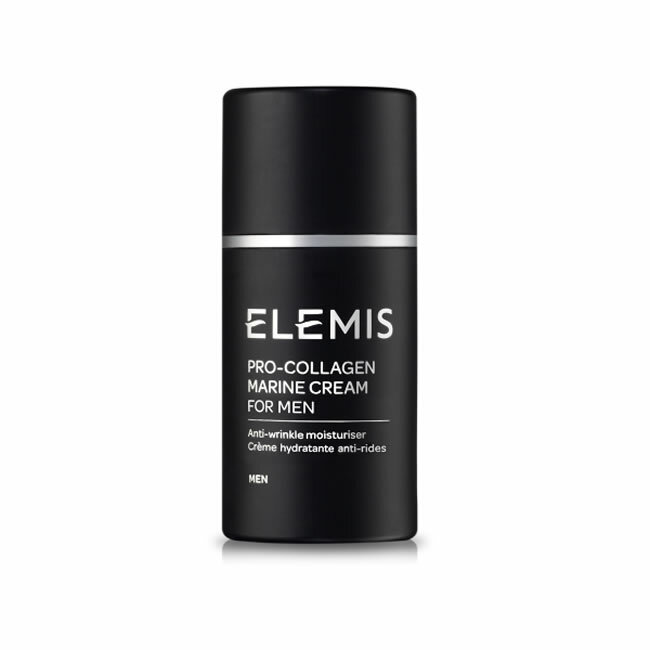 The Elemis Pro-Collagen Marine Cream for Men has been created just for men and helps to hydrate and firm their skin and improve the appearance of fine lines and wrinkles. From the word go, skin is left looking smoother than before and feels refreshed and replenished. Mediterranean Algae, Padina Pavonica, Ginkgo Biloba and soothing Abyssine™ come together to help with suppleness, firmness and elasticity – what’s not to like? The Decleor Triple Action Shave Perfector is a super serum that prepares the skin for shaving. A cocktail of essential oils have been mixed to meet the exact needs of men’s skin and this can lead the way to a smoother, clearer, fuss-free shave. Applying three drops of the serum to cleansed skin will prepare it for shaving, and when used after your shave, it can soothe razor burns and enhance the effectiveness of your other products. With a month’s supply of the world’s first fully customisable shave routine, the Dermalogica Shave Essentials Trio shows you how well you can treat your skin when shaving. The set comes with the Dermalogica Daily Clean Scrub (44ml), Dermalogica Soothing Shave Cream (74ml) and Dermalogica PostShave Balm (10ml) and we think you will be hooked after your very first shave. Whether it’s from golf, driving, football or gardening, the Elemis Aching Muscle Super Soak will help to ease overworked, tired muscles. This natural foaming bath soak smells amazing and works wonders on aches and pains. Extracts of Birch, Juniper, Clove, Alpine Lavender, Wild Thyme and Blue Chamomile have been mixed with Sea Salt which together warm muscles and recharge bodies. Men don’t escape the ravages of time, which is why so many of them love the Elemis Anti-Ageing Time Defence Eye Reviver. This lightweight anti-ageing men specific eye cream has been clinically proven to reduce the depth of wrinkles by up to 37% in less than a month and increase skin hydration by up to 82% in the same time period – wow! Created to help support skin elasticity and to tighten, firm and hydrate, this will be a welcomed addition to any bathroom cabinet. When it comes to the sun, everyone needs protection. The Dermalogica Protection 50 Sport SPF50 defends against UV light and can be used by anyone, so no excuses boys. Oleosome Microspheres enhance the performance of the SPF and counteract the moisture loss that can be triggered by being out in the sun. The cream sinks into the skin without a greasy after-feel and should be liberally rubbed into your skin at least 15 minutes before going into the sun. If you have any questions, or would like to try before you buy, get in touch and we can give advice and send samples. Have a look in your diary and we are pretty sure that from now until January you will have a whole host of festive parties and events to attend. From the office Christmas lunch and drinks with the neighbours, to nights out with the girls and New Year celebrations, this is a busy time of year and it is only natural that you want to look your best. As well as choosing the perfect dress, finding shoes you can actually walk in and a bag that works for all occasions, you want your skin to look great too. At Pure Beauty, we sell a range of gorgeous products which can help do exactly this. If you only have time for a quick shower before heading out to a party, may we suggest you use the Dermalogica Conditioning Body Wash. This rich, conditioning cleanser is soap free which means it leaves your body feeling soft and silky every time you step out of the shower. Essential Oils of Tea Tree, Lemon, Eucalyptus and Rosemary purify without stripping natural moisturisers, while Sandalwood, Lavender, Orange and Clary Sage leave your skin conditioned, smooth and smelling great. With travel sizes on sale too, you can pop it in your wash bag, get ready after your last meeting and still look fresh and awake when you arrive at the bar. If it is smooth skin you want, look no further than the Elemis Devils Mint Body Scrub . Packed with silicon-rich sea plant particles, Devils Apron seaweed and Peppermint essential oil, using this scrub will not only clean your skin, but take away the dead skin cells that cause dullness too. Use in the shower and follow with the Elemis Exotic Frangipani Monoi Body Cream and your limbs will feel satin soft, look silky smooth and you will smell amazing and you dance the night away. For fresh, shiny hair, look no further than the Dermalogica Daily Cleansing Shampoo. Suitable for everyone, this nourishing, sulfate-free shampoo has a robust, foaming lather that is packed with moisturising oils which infuse softness, and manageability. Follow with the moisture rich Dermalogica Daily Conditioning Rinse for an added bounce, shine and delicate fragrance. If you want skin that glows, without the damage caused by sunbeds, why not try the Decleor Gradual Glow Hydrating Body Milk? This gorgeous moisturiser not only offers socks into the sink and offers intense nourishment but it builds a beautifully natural golden glow that is perfect for the party season. Extracts of Vanilla from Tahiti have been blended with Magnolia Essential Oil to create a rich, softening lotion which sinks into your limbs and helps them look healthy and sun-kissed. This body milk is best applied to dry skin after exfoliation and showering, using gentle massaging movements evenly over the body and do remember to wash your hands after use. If you want to firm up your skin before slipping into that little black dress, you might want to consider trying the Decleor Body Firming Oil-In-Cream. This light, firming oil-in-cream helps improve skin firmness and elasticity. It has a fresh, floral scent with hints of Grapefruit Essential Oil, and when used morning and night skin appears smoothed, soft, supple and toned which is just what you want when you are out with friends celebrating Christmas. If you have any questions, or would like to try out a sample or two, get in touch and we would love to help you find something that works perfectly for you. This shower cream from Elemis is a nourishing formula based on organic oats and contains essential oils of lavender, chamomile, geranium and palmarosa, all of which were produced in Great Britain. Omega-rich echium oil works to hydrate and nourish the skin, whilst vitamin and mineral rich organic Oats and Rosemary gently cleanse the skin, for a truly restorative in-shower experience. This firming cream from Dermalogica contains organic silicones – this is important because low-quality silicones can drag on the skin, create a sticky feel and can even bobble on the skin rather than soaking in properly. It’s designed for ageing skin and promises to protect against damage, accelerate repair, strengthen elasticity and improve smoothness. This gel mask from Elemis is designed to resurface the skin, leaving it look tighter, firmer and more even. It harnesses the power of organic fruit acids from acerola cherries which safely and effectively exfoliate the skins surface adding to the resurfacing efficacy of the mask. It bears the Elemis promise, which means it contains no parabens, sodium laureth sulphate, DEA, mineral oils or artificial colours. This little bottle contains a highly powerful blend of essential oils, including organic menthol, which combine to soothe the senses, aid relaxation, make sleep come more easily and help promote harmony, tranquillity and relaxation. As well as menthol, it contains patchouli, eucalyptus and lemon, all known for their calming properties. This serum from Elemis is a huge ally in the battle against ageing and contains methylsilanol manurronate, an organic derivative of seaweed, which helps to bind moisture in the layers of the skin, leaving skin feeling firm and strengthened whilst smoothing the appearance of wrinkles. The product has an immediate tightening and firming effect – we like to call it our ‘face lift in a bottle’! Shower and bath products are probably the thing which we use the most and usually over our whole body, so it makes sense that we’d want this product to contain the best ingredients possible. This nourishing shower cream from Elemis contains a mix of organic oats and essential oils such as lavender, camomile, geranium and palmarosa to cleanse and enrich the skin whilst adding a layer of moisture to dry skin. Spot-prone, oily skin can be really hard to control and finding powerful products which contain organic ingredients can sometimes be tricky. However, this Clearing Mattifier from Dermalogica contains organic silicones which melt gently into the skin to help minimise fine lines, retexture the skins surface leaving it smooth, all while controlling shine and leaving your face shine-free. One of the things we love about this Micellar Water from Elemis is how effectively is manages to remove make-up while being incredibly gentle on the skin, and this is thanks in no small part to the organic English rose water is contains. It removes dirt, make-up and impurities but still maintains the natural protective barrier of the skin, giving you a clean but perfectly balanced complexion. This formulation from Dermalogica is designed for extremely dry or prematurely ageing skin and offers a level of moisture which is much needed when the skin starts to lose elasticity. The organic silicones provide a layer of protection from external damage, helping to protect, repair, strengthen and improve smoothness of your skin. When your skin is starting to show signs of ageing, you need powerful ingredients to reverse those signs, which is why Elemis created this mask which combines targeted enzymes which encourage the breakdown of dead skin cells and promotes cell regeneration. It uses various fruit acids, including organic Acerola cherry acid which effectively exfoliates the skins surface adding to the resurfacing efficacy of the mask. When we think about the havoc that our hormones can wreak upon our skins, we usually associate that with puberty, periods and maybe pregnancy. However, for the older ladies among us, the menopause can also leave us with unwanted effects to our skin and the depleting hormones can cause no end of skin problems. We’re taking a look at some of the most common skin issues associated with the menopause and giving you suggestions of how to deal with them. As you age, your skins ability to produce collagen is reduced, which leads to a marked increase in the elasticity of your skin and skin which is more wrinkled and sagging. We recommend the Decleor Anti-Ageing Starter Kit, which contains everything you need to start to rejuvenate your skin, reduce the appearance of wrinkles and encourage natural collagen production. Ageing skin also loses the ability to retain water in the same way that younger skin does, which means that using a good moisturiser is vital, post-menopause. Dermalogica Intensive Moisture Balance is the perfect moisturiser for dry and prematurely ageing skin as it contains an ultra-rich blend of phytonutrients, vitamins and humectants that helps restore vital moisture. Although we aren’t yet sure why, research has uncovered a link between oestrogen depletion and an increased risk of melanoma, which means it’s even more vital to use protection against the sun. Decleor Ultra Protective Anti-Wrinkle Cream SPF50 Face is specifically formulated to protect ageing skin from the sun’s harmful rays and will provide both sanctuary and repair whilst actively reducing fine lines. Believe it or not, just in the way that the sudden increase of hormones can cause acne, so can the sudden depletion and many menopausal women report cases of acne, which can obviously be distressing. Getting a good cleansing and moisturising regime in place is really important for keeping acne under control so using a system of products like the Dermalogica Clear Start Breakout Clearing Kit would be a sensible move. When you start to succumb to the menopause, one of the knock-on effects is that the skin starts to thin which can lead to areas of sensitivity. Decleor Rose D’Orient Soothing Oil Serum is a natural elixir which is designed to immediately cool and soothe sensitive skin, reducing redness and stopping the face from feeling dry and tight. Only a few drops are needed and you’ll feel back to normal in no time.